Growers Urged to Keep a Watchful Eye for Wheat Viruses, especially in fields where volunteer wheat was prevalent. Youth Corn Challenge Offers Real-World Experience, Rewards. See who won and learn about what they tested in on-farm research. 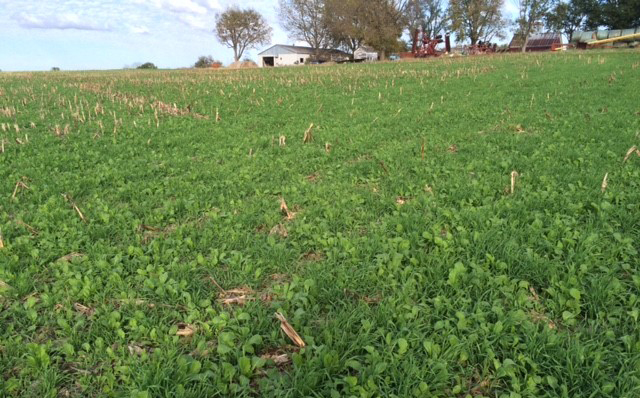 Nebraska Cover Crop Conference Feb. 14 to feature speakers with extensive experience using cover crops in corn-soybean rotations. Pre-Harvest Marketing Strategies in Years with High Ending Stocks. View data and charts for historical and high ending stocks to help guide your strategy. Market Journal: View segments on recent grain market price movements, the soybean season in Brazil, the world's second largest producer, the Keystone XL Pipeline, and the forecast for the coming week. New Southeast Nebraska Sprayer Clinic Feb. 8 to help prepare applicators for changes ahead with new products, increased potential for drift. Grain Marketing Workshops in Alliance and Sidney next Week.